YO3IIU has written a post on his blog showing how he was able to create a coherent multichannel receiver using several RTL-SDR dongles all running on a single clock source. 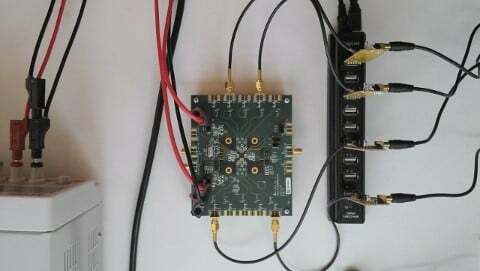 To do this he used a CDCLVC1310-EVM board which provides up to 10 clock outputs and then connected four of the clock outputs to the clock inputs of four separate RTL-SDR dongles. He then uses a GNU Radio program to correlate the signals from each RTL-SDR stick. Recently we have seen two applications of an RTL-SDR based coherent multichannel receiver used in passive a radar systems here and here. How have you correlated the signals in GNU Radio?